Two words; an essence, a feeling. The light that can shift a situation from challenging to seeing anew, from amazing to, yes, even better! It’s gratitude. Those two beautiful words: thank you. Many of you know we’re hosting a blog contest on gratitude, because those two powerful words can create some of the best change in the entire world—and because we know you want to be blogging! Gratitude, when infused into our work, provides clients with the utmost in service, that electricity that’s charged with something even more powerful: purpose. When we recognize how incredible our tribes are–those ideal clients we love to work with, our social media community, our staff, aligned strategic partners and all those we serve—that’s when magic happens. Gratitude gives. Gratitude lights the path for the most solid, foundational, beautiful, electric and, yes, valuable service. When we come from a place of being truly authentic and appreciative of those we get to work with, it builds a solid bond of trust. As a business owner, service provider, entrepreneur, when we infuse gratitude into our businesses, our clients know we’re grateful for them. In turn, they trust us. When we include the element of being thankful into what we write—illuminating what we provide specifically—that’s when prospects, hot leads and current clients know they’ll be looked after. It comes down to passion, serving with purpose and being grateful for the opportunity of every moment. This makes for stronger copywriting when we’re writing from a place of gratitude. When we’re grateful for our clients, prospects and leads, we really work to understand their needs. How can we better serve them? What information do they require, and how can we be more crystal clear in our delivery of content that ignites for them with clarity? When we’re grateful for the opportunity to work with our clients, we both have and provide more clarity. They understand better, and they’re grateful, too. See how that thank you can have ripple effects? It’s a gratitude-growin’, crystal clear—and, in copywriting—highly positive effect. The heartbeat of our work, our driving passion for why we do what we do. It feels so good to live in it. When we’re grateful, our purpose is magnified. We feel it—and it feels good (Great, fantastic, fabulous even!). Saying thank you, especially when you’re on point and on purpose amplifies your copywriting. When you infuse your content with gratitude, your tribe can feel it. They know you’re driven, living on purpose—and it shows in your content. With clarity, trust and a passionate purpose—and those two simple words, thank you—your gratitude permeates every you do. It’s an energy, a feeling, a clarity and radiance. A high vibin’ feeling that makes everything electric. So What Am I Grateful For? 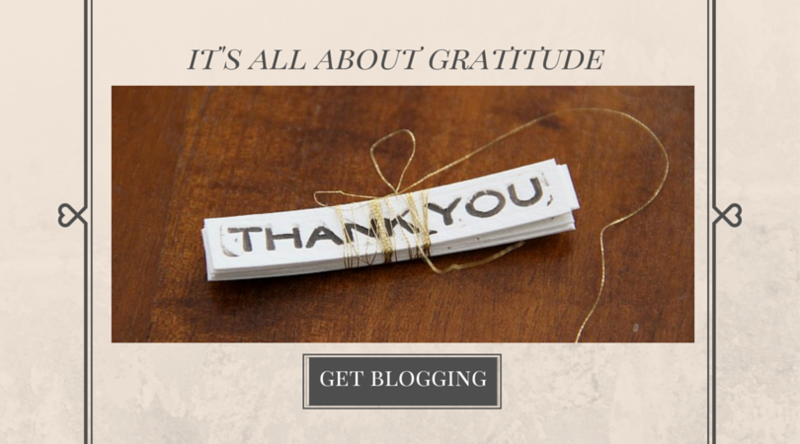 In our blog contest on gratitude, I asked the question. It’s only fair I answer it, too. I hope, in this blog, you can feel it. I am grateful for you. My tribe; clients, social media posse, prospects and leads who ask all the right questions, people who send me notes and say those two beautiful words: thank you. Strategic partners who work creatively and in their flow to make magic. Promoters who ask me to speak and give me opportunity to reach more people with my message (because my message is meant to reach the masses, too!). My family who stands behind and beside me, supporting me in this wild idea to do what I love, and make a living at it, too. And all of you. All of you. If I didn’t have all I have, I wouldn’t be able to serve and live my passion, which I am so blessed that I get to do.